Metal disposal case that's a simple and safe way to remove used Feather-type razor blades. Available in an eye-catching green and white design. £2.10 (inc. VAT) Why no VAT? We're a trade wholesaler and quote our prices without VAT to help our VAT-registered customers understand the true cost of a purchase. Packs of 12 feather cut blades designed to fit the Ama 80 and Ama 81 shaper razors. Excellent value Feather razor blades that fit all standard hair styling razors, including the Ama 80 and Ama 81. Available in packs of 10 or 100. Pack of 10 blades designed for use in the Feather Nape razor. Each blade has its own guard to prevent cuts without affecting shaving performance. High quality razor blades that have been triple-ground for the best cutting edge angle and then double-coated for improved durability and a low shaving friction. Supplied in a safety dispenser pack of 20 blades. Durable and low friction blades with patented, semi-circular guards that mean a longer life combined with a safer, smoother shave. Available in a pack of 15 blades. Regular-size feather blades that'll fit many different feather razors. 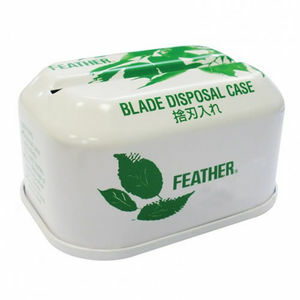 Supplied in packs of 10 or a money-saving pack of 50 which includes a FREE blade disposal case.